Fritschi's Eagle 10 and Eagle 12 (for maximum DIN setting) replace the Explore/Express bindings as the slightly-lighter alternative to Fritschi's hugely popular Freeride Pro Alpine Touring Binding. In either version the Eagle is a highly-evolved step-in A/T binding, with a design and feature set almost identical to the Freeride Pro. 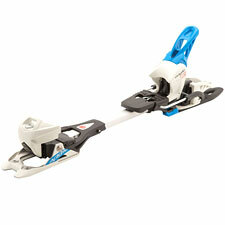 Like the Pro, the Eagle features a sliding binding bar to allow your ski to flex naturally underfoot. Unlike the Freeride Pro, the Eagle features a tweaked pivot point that improves the binding's glide-and-stride ergonomics. The Eagle is certainly a highly-polished binding—indeed, a joy to use—but what's most interesting about it to me is what it is not: light. Fritschi has ridden the Freeride movement wholeheartedly in the downhill direction, forgetting—perhaps—that weight matters above all else when it comes to climbing. Thus, when you add ski brakes, the Eagle is only just lighter than the heavy-duty Freeride Pro. You could argue that Fritschi has simply given up on competing with Dynafit bindings, preferring instead to occupy the downhill performance-oriented Freeride niche. Unfortunately for Fritschi, Marker has jumped very aggressively into that very same pond with its Tour F10 and F12 bindings. Evolved the Eagle and Freeride Pro may be, but neither is a match on the downhill for the Marker offerings, either in terms of retention or release quality. Perhaps most significantly, the Marker Tour F10 and the Fritschi Eagle are essentially identical when it comes to weight. To be sure, the Fritschi Eagle is a wonderful binding to use. The ability to change modes on the fly remains a huge asset, the pivot point in either binding outperforms the Markers, and there is a seamlessness of design to the Fritschi bindings that is truly compelling. But man, as of 2012, that niche between Dynafit and Marker sure looks mighty skinny. You have to think Fritschi is rethinking its strategy of ignoring weight as a design consideration. If I'm going to be on a step-in binding now, I want no less than the downhill performance of a Marker Tour. And if I'm worrying about weight, I'm going to be using Dynafit. Where does that leave Fritschi?